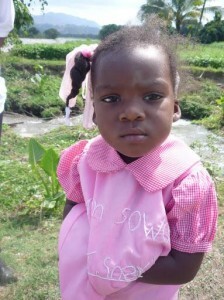 This young girl is one of the area’s residents who will benefit from the project. The destruction caused by the quake allowed water to find its own way through the farmland, making it virtually unusable for irrigation. January 10, 2013, Léogâne, Haiti–As we mark the three-year anniversary of the 2010 earthquake in Haiti, we reflect on the progress made on the recovery and reconstruction efforts in the disaster-plagued island – and on one project in which Canadian Feed The Children, supported by the Canadian International Development Agency (CIDA), and our partners played a critical role. CFTC’s generous donors – who’ve long had an interest in Haiti’s development – have been supporting agricultural-based programming in Haiti to improve food security for Haiti’s impoverished rural farmers through local partners since 2003. These partners (amazingly in some cases), continued to operate in the immediate aftermath of the earthquake. 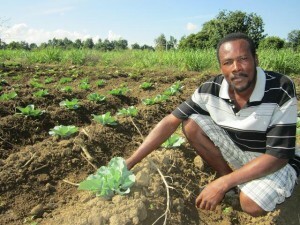 With well-established working relationships and project management resources, CFTC Haiti received a CIDA grant to bring water back to farmland through an irrigation system serving the community of Bongnotte in Léogâne, Haiti – less than 10 kilometres from the earthquake’s epicentre. The irrigation system had been in poor repair before the quake and was almost completely destroyed afterwards. CFTC’s objective, however, was not just to rebuild the system and increase the arable land available to feed the 10,000 residents of Bongnotte, but also to ensure that it fulfilled the promise of improving the quality and quantity of produce available. This would translate into long-term food security for the area’s 1,000 smallholder farmers. While pressure from the public and stakeholders on the ground to do something quickly was intense, CFTC stuck to the best practice principles of development: to deliver impact through community-sourced, community-led and community-maintained initiatives. We knew that applying a participatory development approach in a disaster zone would be a challenge but the only hope to leave the area with sustainable income opportunities and strengthened local capacity. CFTC Haiti’s first step was to enlist the general contracting services of a local firm, Firme de Construction et de Service Agricole (FICOSA). Having worked with FICOSA on a previous project rebuilding a girls’ dormitory at House of Hope Orphanage in Gressier, Haiti, we knew they were capable of delivering a professional result. Even more importantly, we knew they would stay true to a community-led approach by employing local trades and labour, and sourcing all materials locally. FICOSA’s knowledge of the area and sensitivity to the risks and “unknowns” of a project like this – with an aggressive timeline for completion and a physically-challenging (at times even dangerous) working environment – enabled CFTC to focus on the development context to ensure that the project’s capacity-building and food security goals were met. Repairing the badly-damaged and rubble-strewn irrigation system turned out to be a momentous task, as the system was in worse shape than thought and the project was plagued by bad weather among other obstacles. While construction was underway, CFTC organized the area’s farmers’ associations and groups and delivered a series of workshops to representatives of each designed to cascade out and reach the entire farming community. 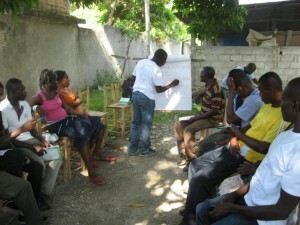 This participatory, “train-the-trainer” approach helped to build capacity in what had been loosely-organized agricultural co-ops working in isolation from each other, and helped them coalesce into stronger organizations within a regional network empowered and capable of supporting ongoing agricultural production and economic development in the area. CFTC also delivered eight agricultural training sessions to 200 farmers, which covered topics including the use of compost to enhance agricultural yields – a practice that was not generally being used prior to this project. Nor had pesticides been regularly or properly used – mostly because the expense was too high, and also because the closest place to purchase them was 35 kilometres away in Port-au-Prince. A total of 600 hectares of land (100 more than was served by the original irrigation system) has been reclaimed and is now available for farming. Another 1,600 people involved in related agricultural services are also benefiting from the increase in arable land. Some of the area residents who will benefit in the long-term from the project. During the project, 15 jobs per day were created, 35 per cent of which were performed by women. Importantly, many of these jobs will last beyond the completion of the irrigation system. Local residents were trained on irrigation system maintenance and three community nurseries were established to provide a base for agricultural consultation, as well as easier access to seedlings for home-based vegetable gardens, especially critical for the many women-headed households in the community. Two composting sites have also been established. This expanded network of agricultural support is contributing to the long-term viability of agricultural production in the area. Tomatoes, sweet potatoes, cabbages, eggplants, sweet peppers and corn yields have all dramatically risen since the completion of the irrigation system, adding much-needed dietary diversity and produce available for sale at market. Completed in March 2012, the project has already produced significant increases in agricultural yield. More than 100 pounds of vegetable seeds were planted and harvested in the first growing season. Previously, the lack of irrigation had meant the land could only be planted with vegetables higher in starch and lower in nutritional value, such as corn, sweet potatoes and other root vegetables. Now, the increased access to water has enabled farmers to diversify their crops. Eggplant, tomato, cabbage and sweet pepper are providing a richer source of nutrients to the area’s families. These vegetables’ shorter growing cycle extends the season, maximizes yield and – with the newly-acquired knowledge of using compost and other vegetable-farming techniques – reduces soil nutrient depletion. The sheer abundance of produce has had a notable effect on local market prices. With produce of greater quantity, variety and quality, farmers are now earning better incomes. The area’s non-farming residents are able to purchase a greater variety of produce more frequently because, with increased supply available, food prices have declined. The net effect is improved food security overall in an area of chronic under-nutrition which should, over time, translate to improved nutritional status, especially among children under five. 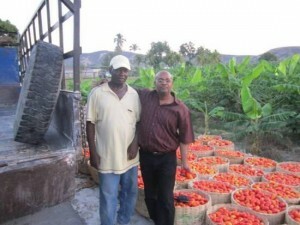 Madsen Gachette, CFTC Haiti Country Representative, and a local farmer with the first harvest of tomatoes. The short-term, quick-fix solution would have re-built the irrigation system using shipped-in, pre‑fabricated materials and labour. The long-term solution that was implemented both more efficiently (despite a two-month extension in the timeline) and more effectively, has empowered an entire community, stimulated economic development for a region in critical need of it and offered farming families food security and sustainable livelihoods that have improved their lives and those of their children. 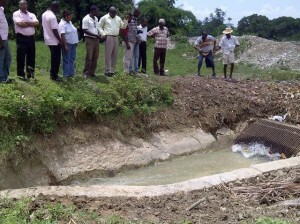 Since completion of the irrigation system in Bongnotte, two tropical storms have blown through Haiti. Hurricane Isaac, although severely damaging to the southeast, west and Artibonite regions of Haiti, largely spared Bongnotte. Hurricane Sandy took a much greater toll, causing massive damage to agriculture, roads, bridges and aqueducts. An estimated 70 per cent of crops in the western and southern areas of Haiti have been destroyed. In the aftermath of Sandy, Léogâne had five consecutive days of rain, which caused serious flooding throughout the impoverished area. In Bongnotte, bananas, corn, sweet potato and manioc crops were ruined. 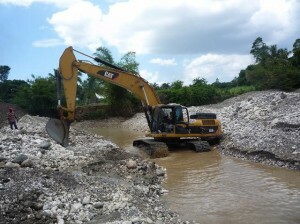 The Momance River – the main tributary that feeds the irrigation system – was swollen with rain and an aqueduct upstream was severely damaged. In the midst of this devastation – which the UN Office for the Coordination of Humanitarian Affairs (OCHA) predicts will put up to 450,000 people including 4,000 children under five at risk of severe acute malnutrition – there is a small bright spot for the people of Bongnotte. The repaired irrigation system, protected from overflow by a 15 x 2.5-metre cement retaining wall constructed mere months earlier, remains intact. 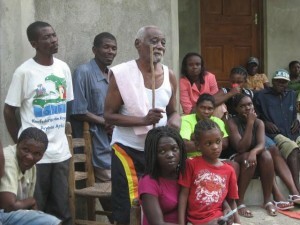 According to a spokesperson from Haiti’s Conseil d’Administration de la Section Communale (CASEC) of Bongnotte, if the wall had not been there before Hurricane Sandy, the houses and people of nearby Grand Bory, Nan Pommier and Melier would not have been there afterwards. That said, the gains made in agricultural production and food security have experienced a major set-back. 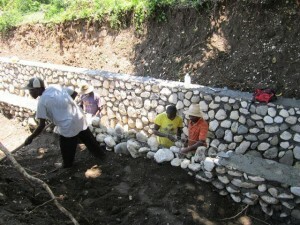 CFTC Haiti has geared up to layer a “crisis relief” response on to its ongoing development work. Local partners – with additional funds provided by CFTC thanks to generous donors – are now distributing food aid, seeds and livestock to address short-term nutritional needs and support longer-term food security by replenishing the crops and animals lost. Having eked out a subsistence living from parched, sandy soil for many years, then experiencing the worst of a 7.0 magnitude earthquake followed by political strife, the spread of cholera and multiple tropical storms, the people of Bongnotte in Léogâne have suffered no end of crisis. Since early 2012, though, they have been able to draw upon their bolstered resources and abilities, which have strengthened their resilience in the face of what nature has doled out. Even now, they are replanting and looking to the future with renewed hope.